This post is the product of a Q&A email exchange between Ady King, a Grade 11 student from Fredericton, New Brunswick, and Sarah Glassford, a Master of Library and Information Science student at Western University with a background in History. We met in the summer of 2017 when Ady gave a presentation to Treasury Board employees at the Provincial Archives of New Brunswick, where Sarah was working as an intern. We draw no broad conclusions, but hope to offer, through the prism of one student’s experience, insight into the role battlefield study tours play in shaping the historical (and perhaps national) consciousness of the Canadian youth who participate in them. Sarah: Civilian and veteran visits to the battlefields of the Western Front began before the peace treaty had been signed: “as many as 60,000 in the summer of 1919 alone.” That number rose to 160,000 visitors by 1939, with guidebooks, tourist agencies, professional guides, and organized pilgrimages catering to their desire to see for themselves. The first organized Canadian pilgrimage reputedly took place in 1927, when 30 Maritime veterans made the trip; in 1936 6,000 Canadians crossed the ocean to see the Vimy Ridge memorial unveiled. A century later, Canadians continue to visit the battlefields of the First (and Second) World Wars, as independent tourists or on arranged tours. Study tours designed specifically for students and/or History teachers are organized by academic institutions including the Gregg Centre for the Study of War and Society at the University of New Brunswick and the Laurier Centre for Military, Strategic, and Disarmament Studies, while less academically or pedagogically-oriented visits are arranged through private companies like Canadian Battlefield Tours. Independent foundations with a memorial or educational mandate also offer students the opportunity to visit the battlefields. Let’s start our conversation by explaining who organized your battlefield visit, Ady. One of the ways in which they do this is by annually hosting the Vimy Pilgrimage Award (VPA) program, a fully-funded immersive educational program in France and Belgium to study Canada’s tremendous First World War effort. This program is open to any youth between the ages of 14 and 17, who demonstrate outstanding service, positive contributions and bravery. Sarah: When did you participate in the program, and how were you selected? 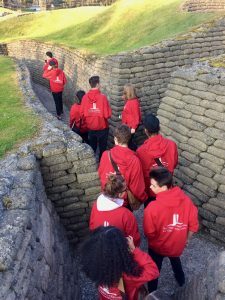 Ady: The 2017 program took place April 7-16, 2017, and included interactive education and visits to significant First World War battlefields, cemeteries, and memorials including the Canadian National Vimy Memorial. To apply, we each had to write a 500 word motivational letter about how we demonstrate outstanding service, positive contributions and bravery and then get two reference letters. 17 Canadian youth were chosen from 314 Canadian applicants. 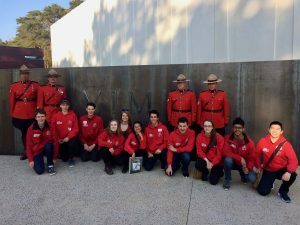 In total, there were 25 VPA participants, because the Vimy Foundation chose to include international participants from Belgium, France, Great Britain, and Germany. 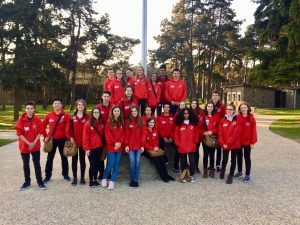 The 2017 visit to Vimy was very special: on April 9th, VPA students joined thousands of others from Canada and around the world to mark the 100th anniversary of the historic battle, at the Vimy Memorial. Sarah: This was definitely a momentous year to participate in the program. What led you to apply in the first place? What did you expect from the program? Ady: I actually have a friend who had done the program a few years ago and suggested it to me. I looked it up and was immediately intrigued. I’ve always been very interested in history and I admittedly didn’t know very much about the Great War so this sounded like an incredible opportunity to learn more while also getting the chance to see the historical sites firsthand (and it was)! I really didn’t know what to expect. I knew that we were going to visit historical sites and learn about the First World War but I had never imagined that it would be such an emotional experience, that I would meet so many incredible people and forge such strong friendships, or that my entire perspective on WWI would be changed, all in only 9 days. Sarah: It’s interesting that you mention not knowing too much about the Great War before you participated in the program. What did you know – either about the conflict generally, or about Vimy Ridge specifically – before the trip? Ady: Truthfully, before the Vimy Pilgrimage Award program, I didn’t know very much about the First World War at all. I remember talking a bit about the Battle of Vimy Ridge in Grade 6 and watching a video or two about it, but we never went into very much detail other than that and focused a lot more on the Second World War. So WWI was more of a mystery to me. Sarah: But you at least knew the war had taken place. (Some members of older generations who worry that not even that much history is being transmitted to Canadian youth will be pleased to read that.) Given that Vimy Ridge has come to hold such a central place in Canada’s public memory of the war, it’s not surprising that it would be one of the specific battles that made it into the curriculum you were taught. Tell me about some of the highlights of your trip. Why did those particular aspects stand out, for you? Ady: Every second of the program was incredible but if I had to pick the two most memorable experiences, I would say they were the Ceremony for the 100th Anniversary of the Battle of Vimy Ridge and our visit to the Maison Blanche underground tunnels. On Sunday, April 9th, 2017, we had the opportunity to attend the Vimy 100 ceremony at the Vimy Memorial in France along with thousands of people. We heard tons of incredibly influential people speak about the Battle of Vimy Ridge and its importance in the shaping of Canadian identity: the speakers and attendees included Prime Minister Justin Trudeau, Prince Charles, Prince William, Prince Harry, Governor General David Johnston, and former French President François Hollande. The Vimy 100 ceremony was the first moment in our program where the magnitude of everything really hit me. Taking in the thousands of pairs of black combat boots placed on and around the monument, each representing a fallen soldier, the sacrifices of our troops 100 years ago touched me in a way that it had never touched me before. As I looked out at the crowd, I realized that the thousands of people in front of me closely represented the number of fallen soldiers who had died in that very place. This realization affected me greatly, as I finally saw a visual representation of the costs of the war and of a single battle. Sarah: There is certainly something powerful about seeing those kinds of tangible markers of loss. The sea of ceramic poppies installed in the moat of the Tower of London (one representing each of the British or Commonwealth war dead) had a similarly powerful effect on the author of a previous centenary commemoration post in this series. I wasn’t familiar with Maison Blanche before hearing your presentation back in the summer, but I gather it’s a kind of cave – a former chalk mine, really – named for a white farmhouse nearby (now red brick) where Canadian soldiers took shelter before their assault on Vimy Ridge. I read that when it was rediscovered about a decade ago, there turned out to be roughly 1,000 graffiti carvings in the walls down there, done by the Canadians. What was it like to visit that site? 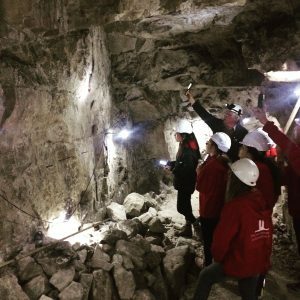 Ady: On April 12th, we had the privilege of visiting the Maison Blanche site as well as going underground on a tour of the tunnels used by soldiers during the First World War. It was incredible to have the opportunity to tour a historic site that the public doesn’t normally get the chance to see. I was amazed to see that over 100 years later, the tunnels had remained unchanged, preserved in almost the exact way they were when they were populated by soldiers of the Great War. With personalized etchings on the walls and active grenades amidst other artifacts on the floor, it is easy to say that this experience was thrilling and definitely once in a lifetime. Not only did I feel blessed to have been given the chance to visit this site which is normally closed to the public, but it was also an incredibly moving experience for me. As I toured their living quarters, I began to feel more of a connection to the men who had dwelled there, and their lives. I began to understand them more on a human level as I saw their drawings and read their little notes on the walls. My experience that day aided me in individualizing the men of the Great War and seeing them as more than nameless soldiers. Each person down there had a life with previous experiences that were vastly different from anyone else’s. This, I realize, is why it is so important to commemorate soldiers as individuals instead of only remembering them within the corps they fought with. Every man enlisted made small but valuable and war-altering contributions that could easily be forgotten, were soldiers not to be remembered in this necessary individualized way. Sarah: This strikes me as touching on a similar theme as all those combat boots at the memorial. The boots gave you a sense of the scale of loss involved at Vimy, and the Maison Blanche carvings gave you a glimpse into the personalities of individual men who were there. In both cases, the impersonal became personal, and touched you in a new way. Canadians who lived through the Great War would have experienced the conflict in this way – in terms of individual men they knew enlisting, leaving Canada, fighting, and perhaps dying. A century later, however, it seems to require these sorts of tangible commemorations and firsthand glimpses to really impress upon us the personal, human cost of the war. It sounds like you had some powerful encounters of this kind during your trip. Ady: All in all, this experience was incredible and eye-opening. I feel very lucky to have been able to see, learn, and experience all that I did that week. Sarah: Looking back, do you consider this program a sightseeing trip, an educational experience, or both? 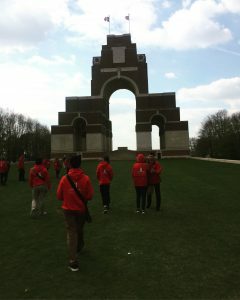 VPA students approach the Thiepval Monument to the Missing of the Somme. Ady: I consider this program to be an educational experience. Everything we saw, did, and explored was related to the subject of the First World War and was highly educational. Considering the loads of assigned reading and the projects they had us complete in preparation for the program, I feel that the Vimy Pilgrimage Award was a lot more than a sightseeing trip. Sarah: Aha! Homework. On that note, what sorts of things did you learn about the First World War, or about Vimy Ridge specifically, that you didn’t know before? Ady: Well, like I said before, I really didn’t know much about the First World War or Vimy Ridge. Through the program, I learned all about the causes for the war, saw firsthand the locations of influential battles and the impacts left by war, explored the topics of art and poetry from the war, and learned random little interesting facts (for example: in WWI, when the first tanks were created, they were called ‘tanks’ to trick the Germans into thinking they were water carriers). For the Battle of Vimy Ridge specifically, I learned all about its importance and its human costs. Before this program, I had no idea how important Vimy was in the shaping of Canadian identity but it actually played a major role in the birth of our nation and of Canadian nationalism because of how Canadian soldiers from every part of Canada came together, worked as a team to win, and succeeded. Sarah: If you take Canadian History in university, your professors might challenge you to revisit the idea that Vimy created a new Canadian identity. There are many good reasons to question that interpretation (some of them explored in this post about Great War-era Canadian interpretations of Vimy’s significance), and it’s useful to think critically about why English-Canadians are taught in school to see Vimy as a turning point in our national identity. In other words, what purposes does it serve today for Canadians to understand the Battle of Vimy Ridge in that way. But that’s food for thought for your future self. You’ll have lots to ponder at that point, when you think back to your VPA experiences. In the meantime, do you think this sort of program is valuable to young Canadians today? Ady: YES!! I think this program is VERY valuable to young Canadians today! I think it’s so incredibly important to know about and honour the major sacrifices that were made in the past and I don’t think enough young people do (I definitely didn’t before the program)! Sarah: Along those lines, do you think your battlefield study tour changed you, or your attitudes, in any way? Ady: This experience changed me in so many ways and I notice it every day. Since the Vimy Pilgrimage Award, I’ve gained a greater appreciation for our troops, the sacrifices they have made and continue to make, and the importance of days like Remembrance Day. I feel that before this program, I never truly understood the impacts of war, the immense losses, and the bravery that it took and still takes to protect our nation and its people. Today, I find myself constantly reminded of those things and possessing a greater sense of Canadian nationalism than I previously had. Sarah: Your fellow program participants came from all across Canada. Do you think this influenced the kind of experience you had during the trip, or the new sense of Canadian nationalism you just mentioned? Ady: I think it did in some ways! Having people from all across Canada in the group really helped us to hear more diverse perspectives. In addition to this, we also had two participants from Belgium, two from France, two from Great Britain, and two from Germany. This helped to further diversify our experience. I feel that if this trip had consisted of 25 participants from Fredericton instead, it would have been very different and I honestly don’t feel that I would have learned as much because of the fact that everyone came from the same city and had similar experiences locally (with the education system, with the community, and with the city). Having people from all over permitted us not only to gain more national and global perspectives but also gave us the opportunity to make connections across Canada and parts of Europe. I believe it assisted in making the experience even more enriching. Sarah: I took part in a cross-Canada youth forum when I was in high school, too, and I remember it was incredibly eye-opening. You don’t realize how different the country and its history look from various places within it until you talk to peers who see it from those different vantage points. The effect is not unlike your point about bringing Canadian soldiers to life through seeing their graffiti 100 years later: our perspectives on what “Canada” is and what it means to be “Canadian” are somehow deepened – perhaps humanized? – by encountering people from various places and backgrounds who share that identity but understand it quite differently. Even if we question the significance of the Vimy Ridge victory for national identity back on the home front, it doesn’t seem too large a stretch to imagine that some of the Canadian soldiers carving graffiti into the chalk walls in 1917 had their notions of Canada altered while mingling with fellow servicemen from other parts of the country. I’ll let you have the last word, Ady. Now that you’ve participated in the Vimy Pilgrimage Award program, if you had to explain Canada’s experience of the First World War in one or two sentences, what would you say? Ady: I’d say that Canada’s experience in the First World War contributed greatly to our formation as a unified country but also brought a realisation of the impacts of war, erasing the romantic notions it had previously been associated with. The Great War brought immense tragedy and took many lives, and was an important time in history that should always be remembered and honoured, but never repeated. Ady King is a Grade 11 student at École Sainte-Anne in Fredericton, New Brunswick. She was chosen as one of 17 Canadian students to receive a Vimy Pilgrimage Award in 2017, which enabled her to participate in the Vimy Foundation’s intensive study tour program. Dr. Sarah Glassford has taught Canadian history at four Canadian universities, and is the author of Mobilizing Mercy: A History of the Canadian Red Cross (McGill-Queen’s University Press, 2017). She is presently completing a Masters of Library and Information Science degree at Western University. ActiveHistory.ca is featuring this post as part of “Canada’s First World War: A Centennial Series on ActiveHistory.ca”, a multi-year series of regular posts about the history and centennial of the First World War. If you are interested in contributing, contact Nathan Smith at nsmith241@gmail.com. Jonathan Vance, Death So Noble: Memory, Meaning and the First World War (Vancouver: UBC Press, 1997), 57. The Vimy Foundation, “Mission,” 2017, https://www.vimyfoundation.ca/about/mission/. Joe O’Connor, “Deep underground, Vimy carvings tell the story of Canadian soldiers waiting for battle,” National Post, 7 April 2017, http://nationalpost.com/news/canada/vimy-underground-subterranean-carvings-by-canadian-soldiers-a-wonder.